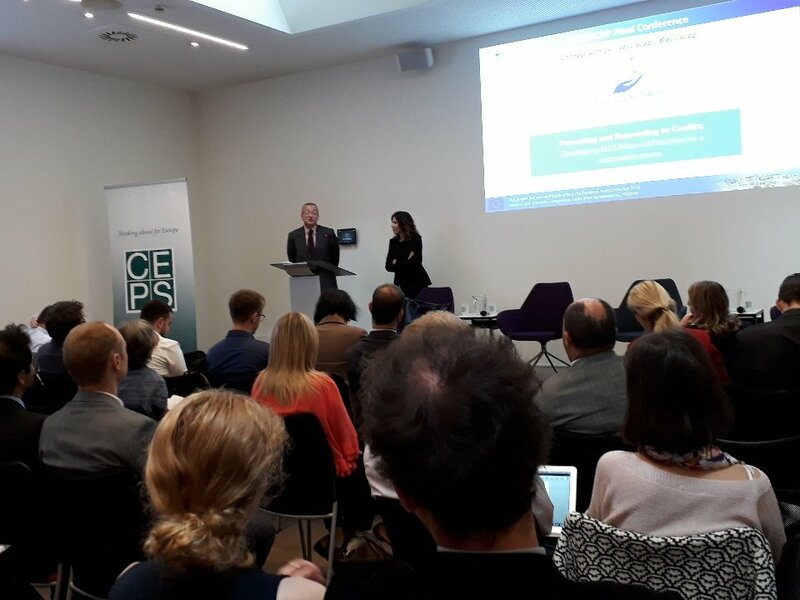 On 12 September 2018, the Centre for European Policy Studies (CEPS) in Brussels hosted the Final Conference of the EU-CIVCAP project under the title “Conflict Prevention and Peacebuilding: Lessons for the EU”. 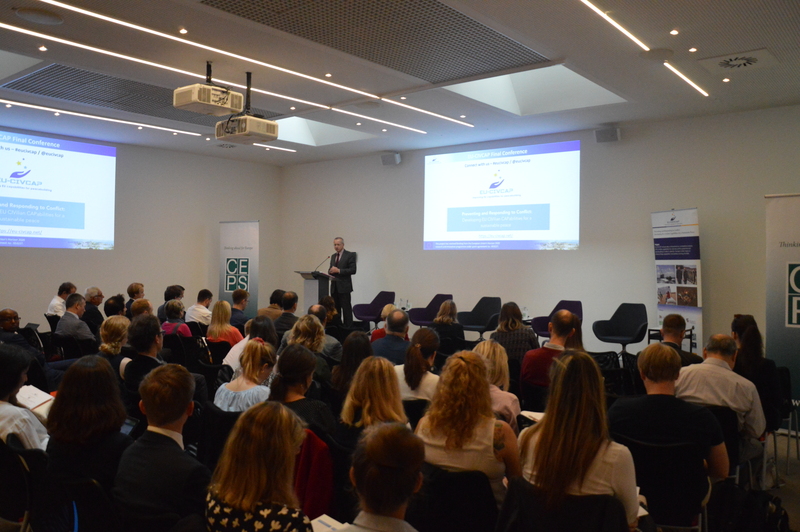 The Final Conference served to showcase the key lessons and best practices identified in the project’s research and the relevance of its main findings for policy-makers and practitioners in EU conflict prevention and peacebuilding. 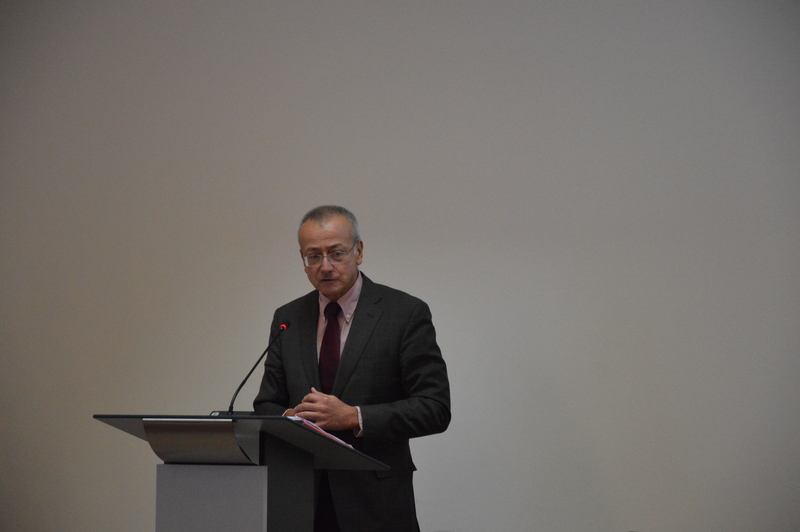 The Final Conference was attended by around 100 diplomats, EU officials, researchers, and civil society representatives. 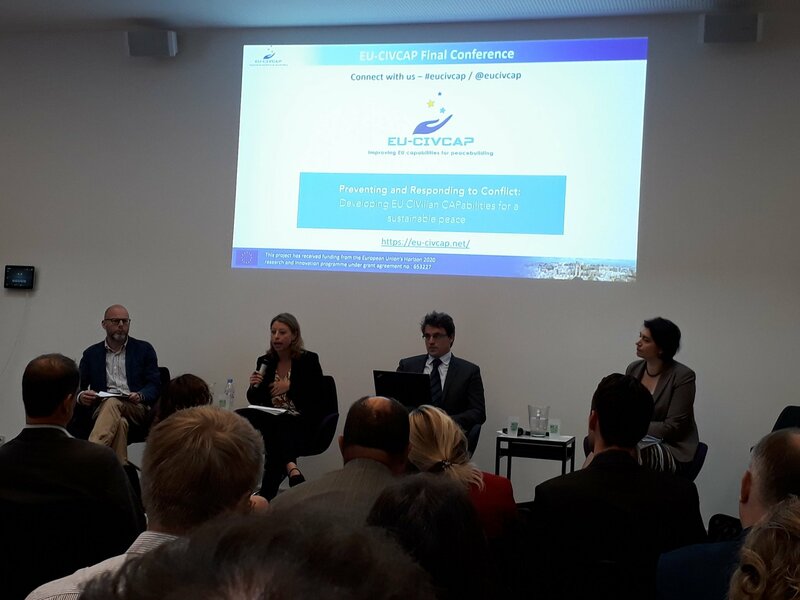 The Final Conference of the EU-CIVCAP project opened with a welcome from the project’s Consortium Coordinator, Ana E. Juncos (University of Bristol). 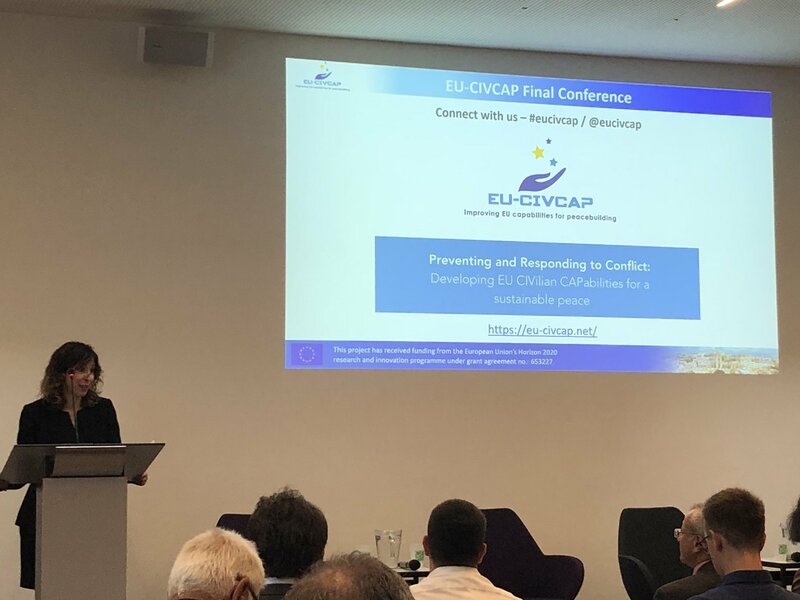 She introduced the project, explaining that EU-CIVCAP takes a comprehensive approach to the entire conflict cycle and aims to provide empirical grounding for policy-making. 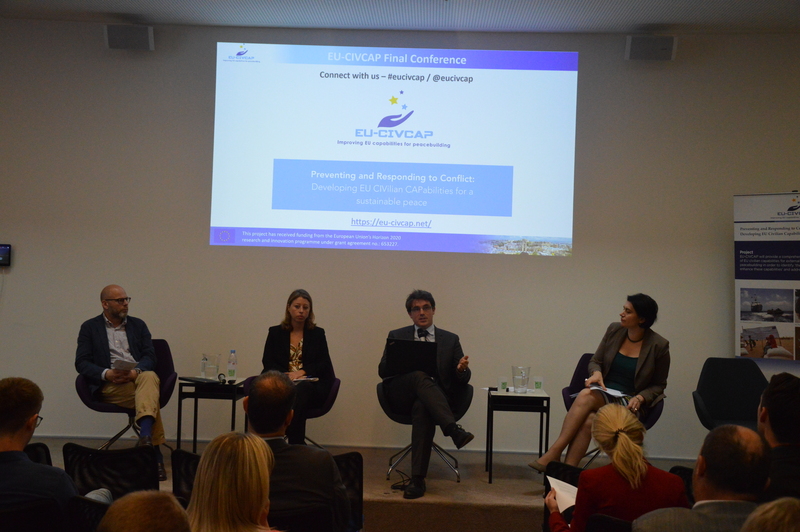 EU-CIVCAP assesses where and why the European Union succeeds and where and why it fails in seeking to prevent or manage conflict and build peace. The project investigated four cross-cutting challenges and took a comparative perspective. 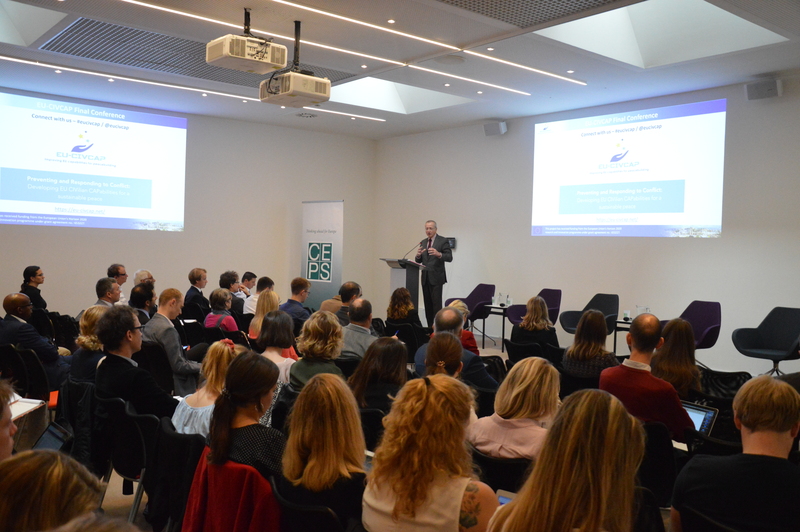 The ultimate aim of the project, as well as that of the Final Conference, is to bridge the existing gap between policy-making, civil society, and academia. 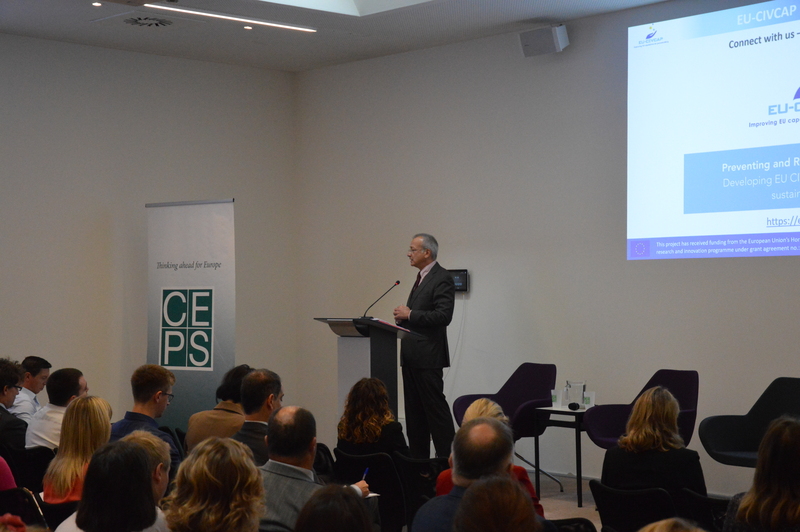 In his keynote address, Pedro Serrano, Deputy Secretary General of the European External Action Service (EEAS), reviewed the history of the EU’s foreign policy engagement, including the two watershed moments that resulted in the EU’s current foreign policy configuration. 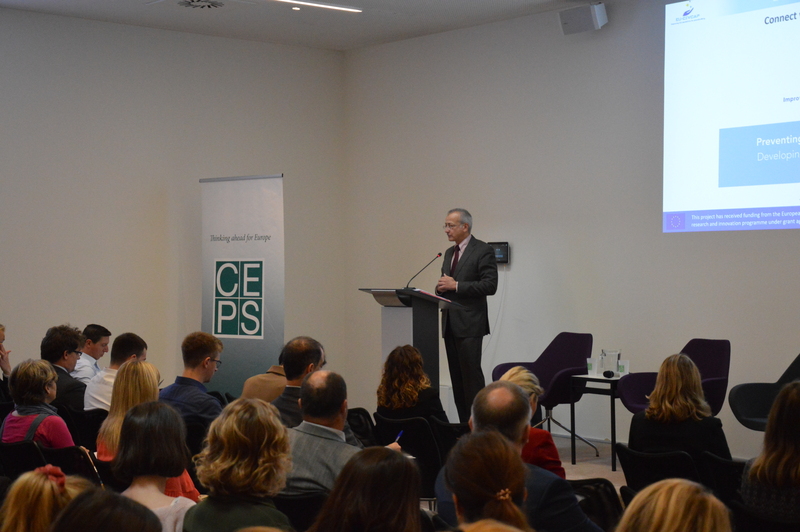 These were firstly the launch of the CSDP, including the 2003 Security Strategy, largely in response to the 1990s wars in the Balkans, and secondly the creation of the EEAS in 2010, and of the subsequent 2016 EU Global Strategy. 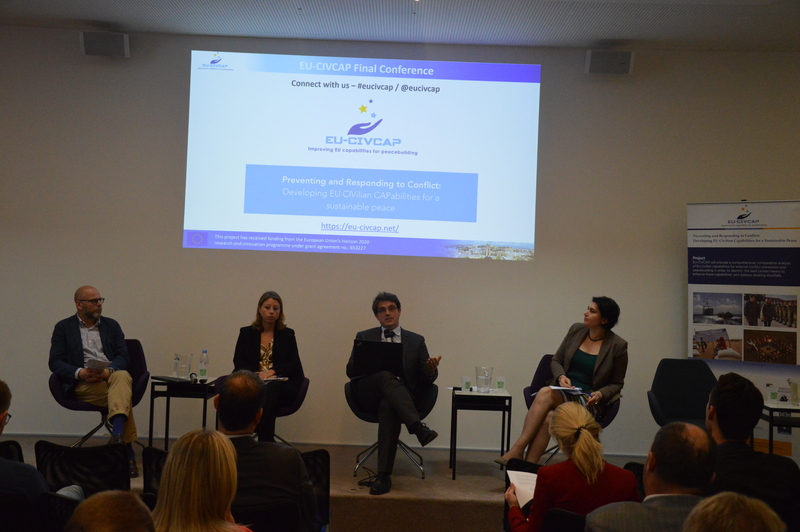 The focus of the EU’s work on conflict prevention and peacebuilding (CPP) has since shifted from the Balkans to Africa. Over the years, the EU has been refining its foreign policy tools, for example on early warning and conflict prevention. Its new early warning system focuses on two dimensions. The first is the medium to longer term: situations that could develop in a one to four-year period, where the EU works with civil society to identify the structural fault lines that could develop into crises in around 20 countries. The second dimension is the short term: a timeframe ranging from a few weeks to a few months in length. Here the EU has mechanisms to mobilise support. 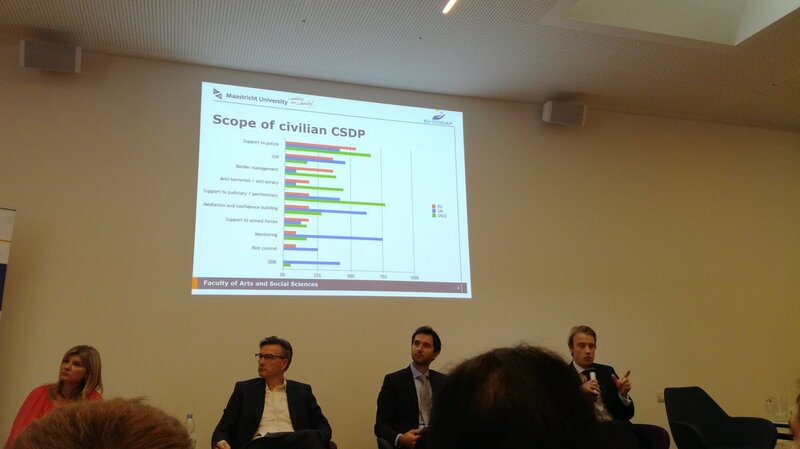 Of the 16 ongoing CSDP missions, 10 are civilian, mostly related to security sector reform (SSR). While it would be desirable to have standing civilian resources—teams of experts that have been pre-trained and are ready for deployment—this is unrealistic at present. 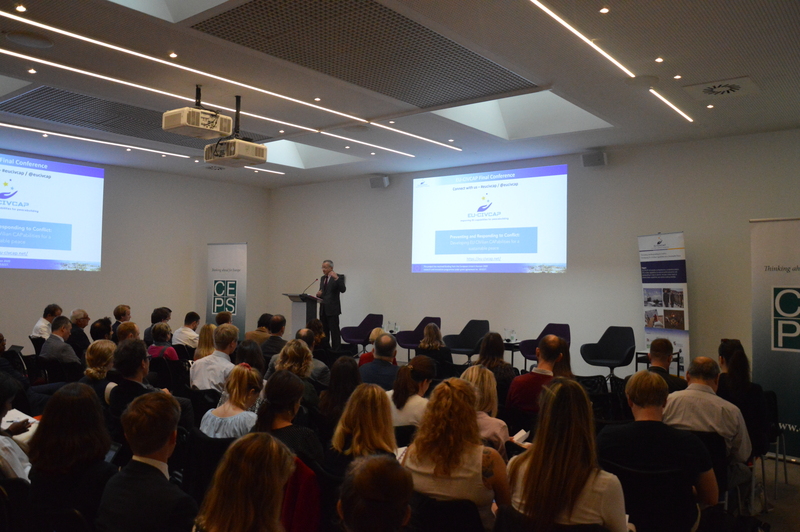 Instead, the EEAS has identified experts in current missions for redeployment elsewhere, and it now also has a new central warehouse to service all missions, with centralised procurement before and during missions. Pre-deployment training has been mandatory since 2017. The Civilian CSDP Compact, which is expected by November 2018, will outline the obligations and commitments from Member States to provide capabilities for civilian CSDP. 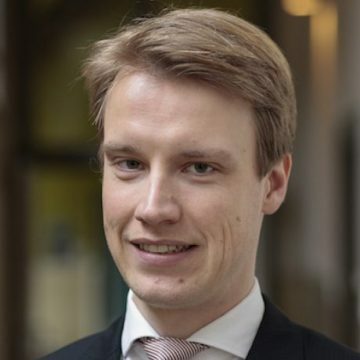 The EEAS hopes that this will help move toward greater capabilities made available, especially of police (since the Member States are reluctant to deploy them and career development is still a problem in this area). 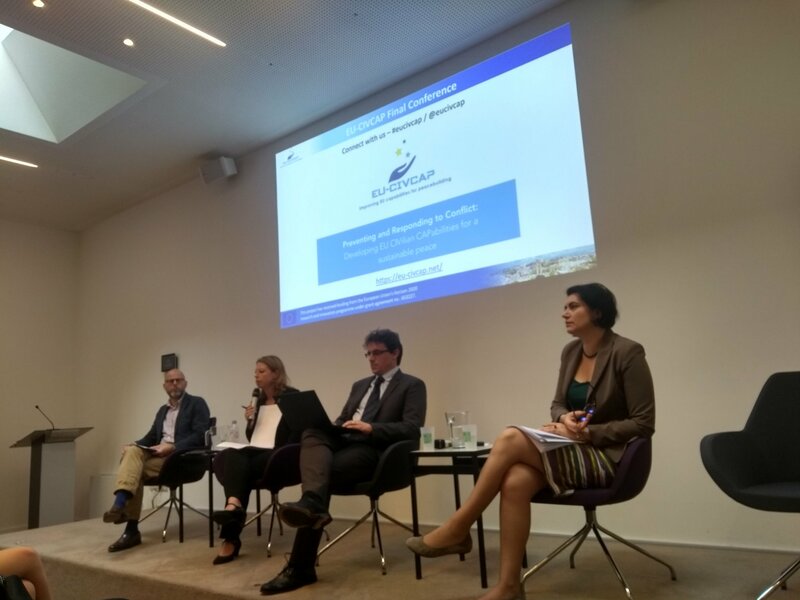 The moderator introduced the panel: Sonya Reines Djivanides (EPLO) on behalf of EU-CIVCAP, and Christoph Meyer (King’s College London) and Silvia Costantini (PRISM, EEAS) as discussants. 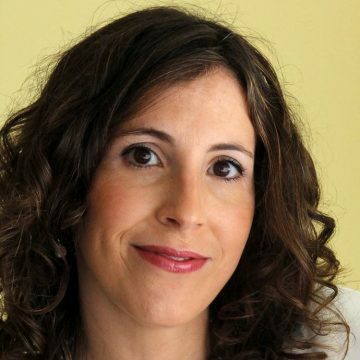 Costantini introduced the latest elements of the early warning system, which is now operating on an annual reporting cycle to seek to predict from one to four years in advance the likelihood of conflict arising. While there are only three people in the PRISM team, more than 120 EEAS colleagues are involved via their network, through which they provide a shared assessment. 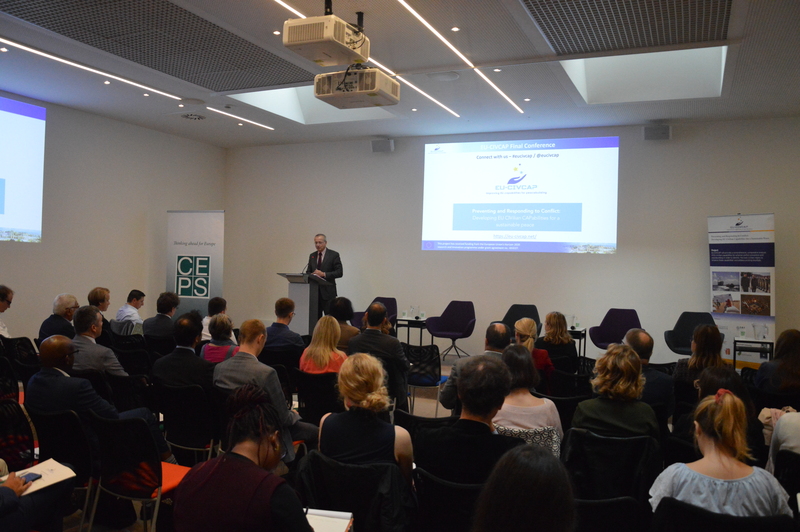 The system is still being operationally tested and through capitalising on best practices the EEAS is seeking to ensure that the system develops further. 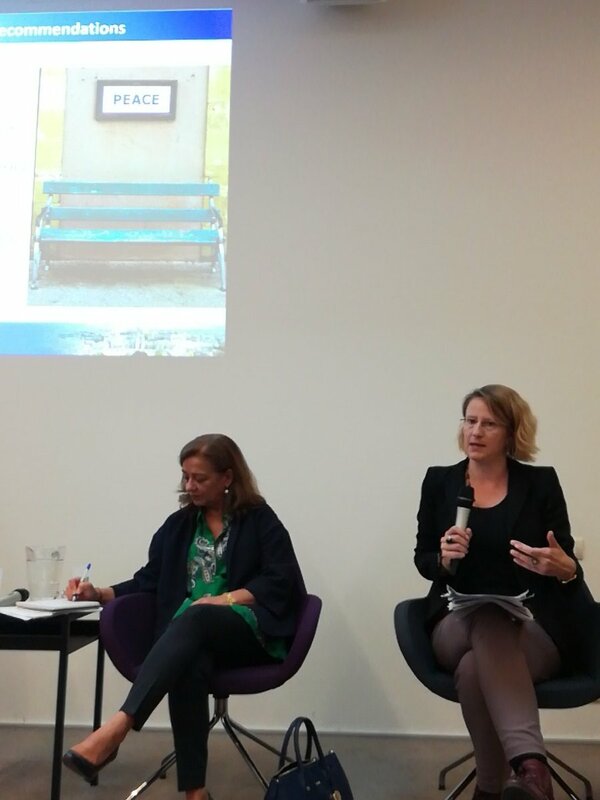 Reines Djivanides introduced EPLO’s findings in the project on EU capabilities for conflict prevention, technologies, due diligence in trade and aid, and gender equality in CPP. EPLO found throughout the research a blurred line between peacebuilding and crisis management, which is problematic. 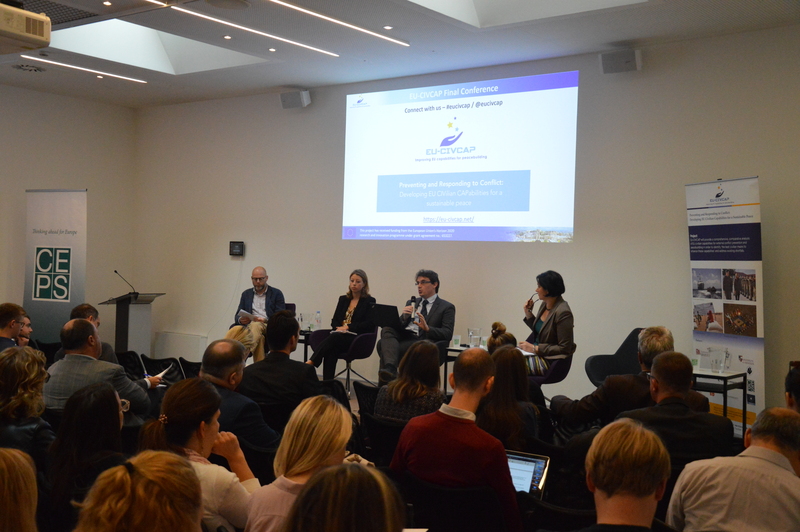 The key issues were: 1) the EU’s ability to engage, and how it is appreciated for its ability to support non-state local actors, which has to do with how the EU is perceived as a principled, rights-based actor; and 2) the EU’s capacity to coordinate and cooperate with key actors. 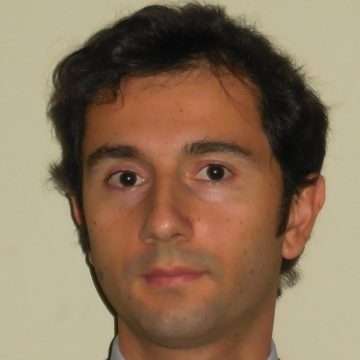 CPP can only be defined in terms of where security can be provided to humans. It is not about how many people were trained, or what resources were provided, but how many communities feel safer, and feel less at risk of experiencing violence – in other words, it is about the impact on local populations. 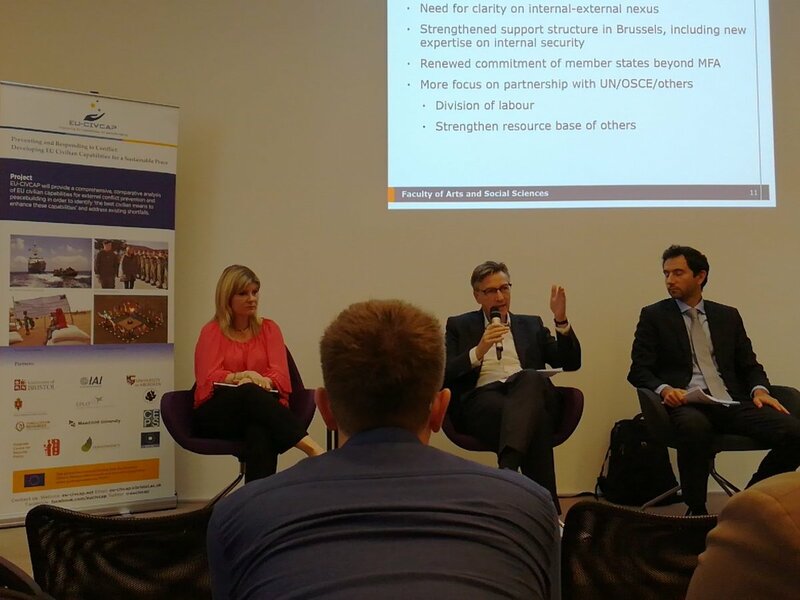 EU SatCen’s research highlighted issues with interconnectivity. The project brought together EU SatCen and EPLO, which would not usually have worked together, and they both learned a lot from this experience. 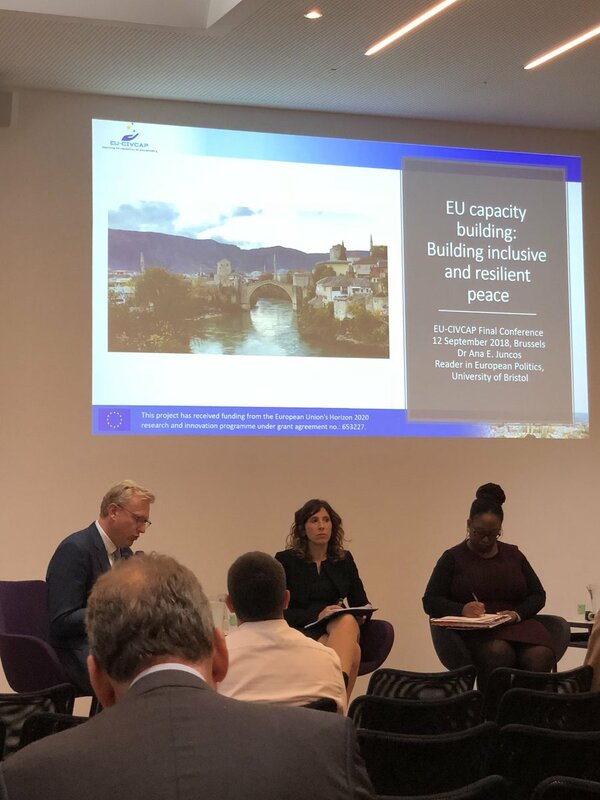 On the topic of due diligence in aid and trade, Reines Djivanides noted that the EU often engages in these activities without engaging with the conflict itself or being conflict-sensitive in their approach. There is a significant opportunity here, she said. A final highlight was the gender equality report, which highlighted how EU foreign policy tends to be gender-blind. 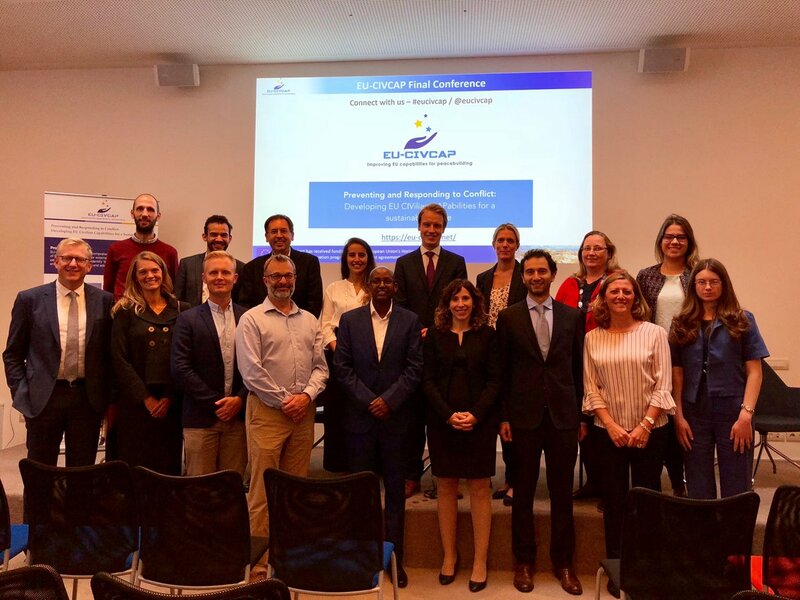 Meyer noted that the EU-CIVCAP project was not solely focused on academia, but rather on making things better – highlighting opportunities for peace and improving a situation, rather than stopping it from getting worse – with a focus on lessons and best practices. He agreed with most of the recommendations but highlighted a few points that he would challenge, for example the fact that the EU is not clear on what conflict prevention is. What are the EU’s interests? If the EU acts where there is a threat to life, but only where this intersects with the EU’s interests, then what is the actual measure? And what is reported through early warning? He supported the notion of a learning culture and asked how this could be promoted. 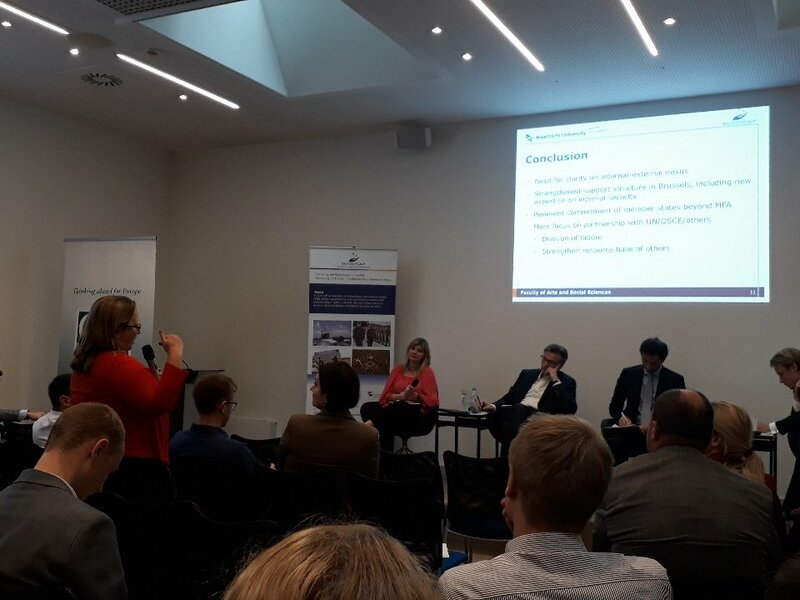 The debate that followed took up a number of these points and added others, for example how to tailor information emerging from early warning to decision-makers, the question of institutional learning and memory, and the shift in the EU’s focus to internal security. 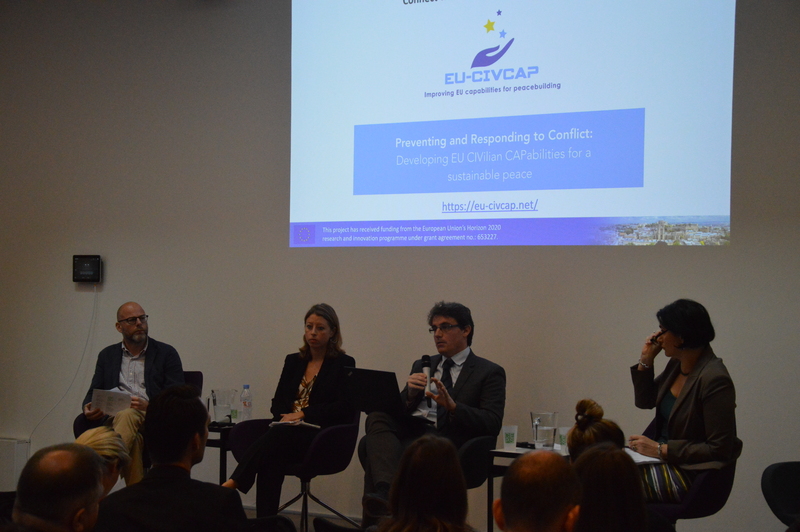 The moderator introduced the panel: Hylke Dijkstra (Maastricht University) on behalf of EU-CIVCAP, and Giovanni Faleg (EUISS) and René van Nes (PRISM/EEAS) as discussants. 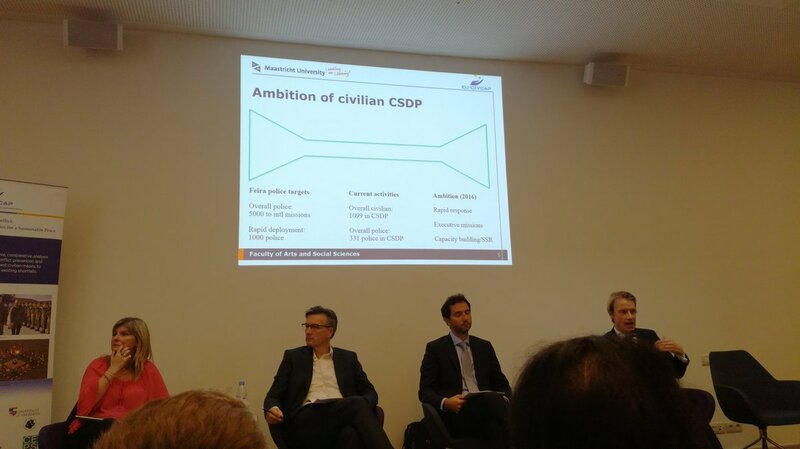 Dijkstra provided an empirical overview of the state of play with regards to civilian CSDP missions, which now have some 1,100 international staff deployed (including 300 police officers). Faleg discussed the evolution from the comprehensive approach to the integrated approach, which he said is essentially about a new level of ambition and the result of international momentum requiring strategic reflection. Now, he argued, the challenge is to turn the vision into processes, policies and action. 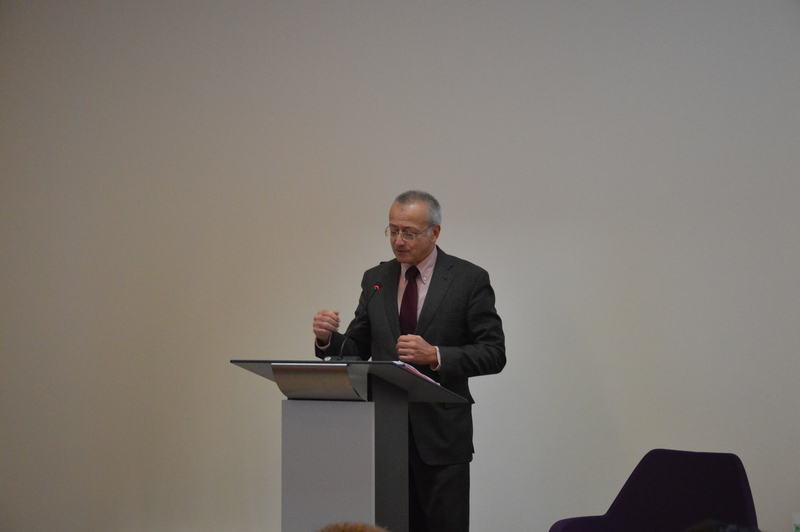 Van Nes stressed the changing nature of conflict, which is becoming both more localised and increasingly globalised. 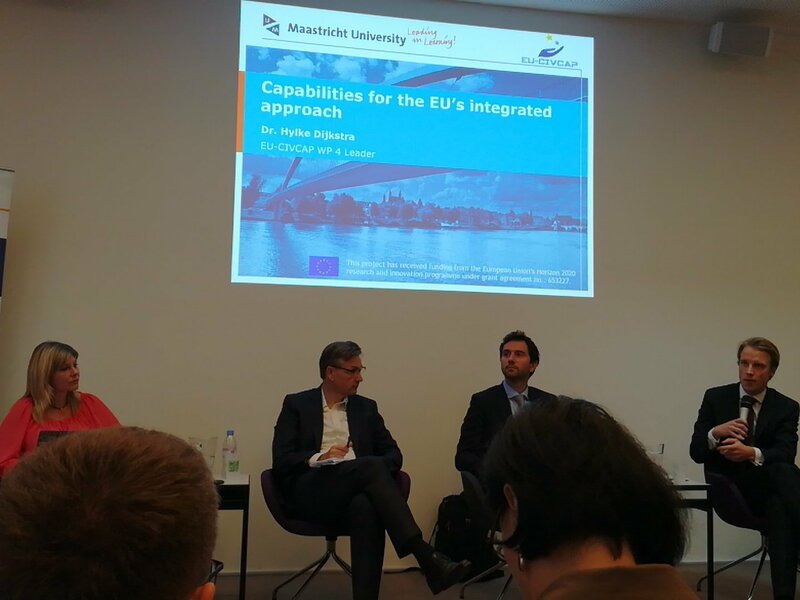 He said that the integrated approach is much more informal than the comprehensive approach had been in the sense that the former informs everything the EU does on conflict and peace. PRISM was created in 2017 to turn concepts into practice. This includes joint missions with the Commissions to generate joint analysis and recommendations based on a shared understanding of conflict actors and dynamics. Some of the current challenges include the fact that Member States and Council Working Groups are organised according to instrument or geography, which leaves no obvious place in which to discuss horizontal issues. In the debate, the panel was asked how to involve civil society in CPP and how to get the balance between military and civilian action right. 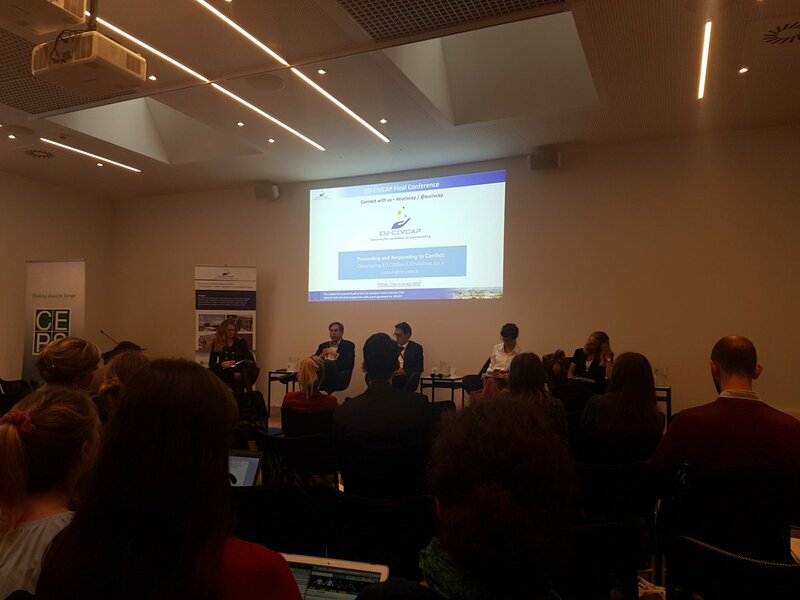 The moderator introduced the panel: Ana E. Juncos (University of Bristol) on behalf of EU-CIVCAP, and Toni Haastrup (University of Kent), Catherine Woollard (ECRE) and Maria-Manuela Cabral (DG DEVCO) as discussants. 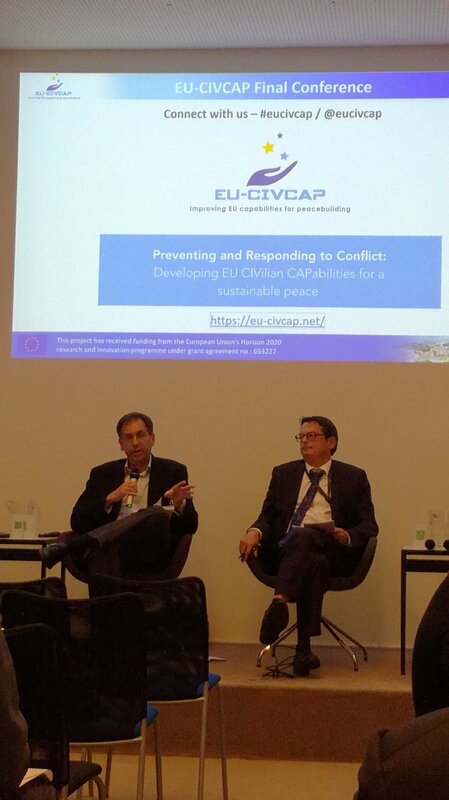 Juncos suggested that while engaging local communities has become a key priority for international actors for promoting sustainable peace, there has been very little conceptualisation of what capacity building is supposed to be. Organisations engaging in these activities, including the EU, often lack the space to reflect on what it is, who should engage in it, and how to do it. 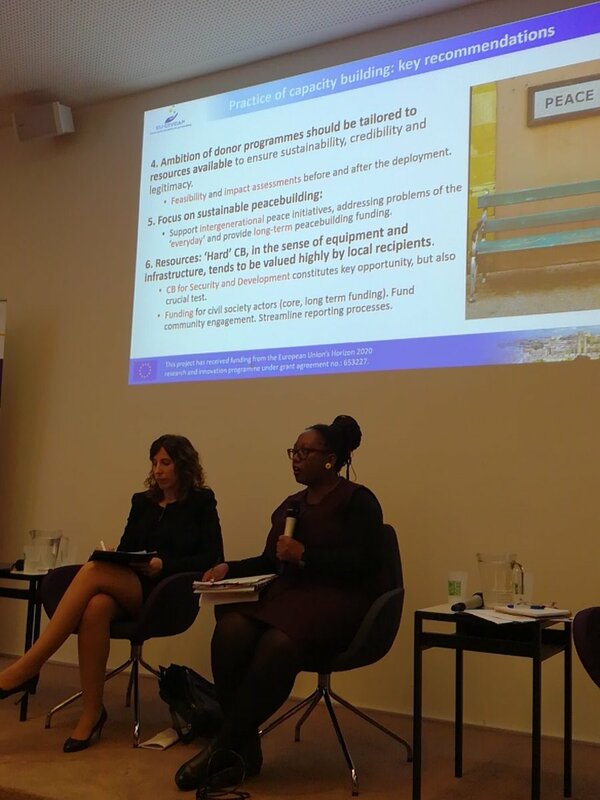 Haastrup highlighted that local ownership has to be intersectional, which can be worked towards by bringing together various strands of the local community, including gender and sexual minorities and people with disabilities. Additionally, if the EU made better use of its relationship with the African Union, she argued, it would not have to “reinvent the wheel” in every mission and re-learn so many lessons. Cabral described the EU as being “under construction”. Foreign policy has brought a new dimension to what used to be development policy. The Commission is trying to understand what it can do when it sees the first signs of destabilisation. There has been a shift away from focusing on economic fragility and resilience as a driver of conflict or peace; she noted that Syria, a middle-income country that sunk into conflict, reminds us why this shift has occurred. 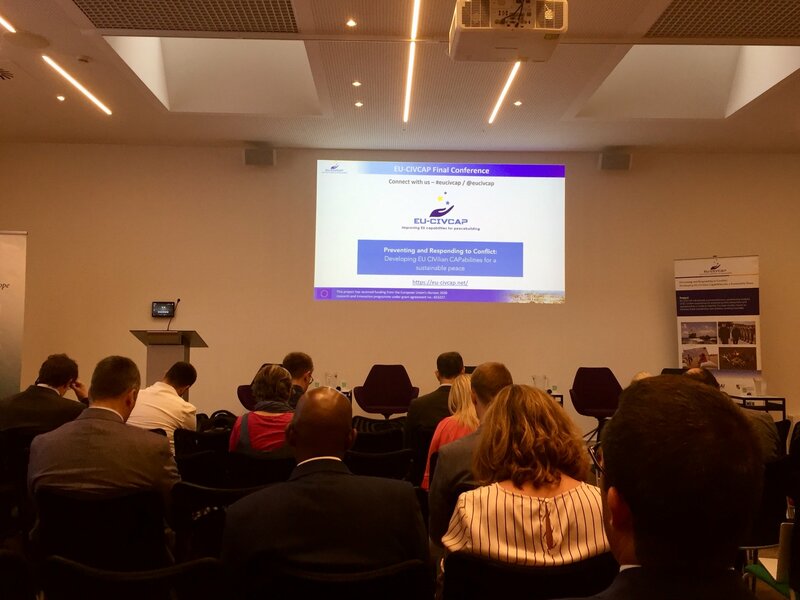 Woollard said that the political imperatives of migration control might now provide the momentum for Member States to provide the resources to CSDP that they failed to provide before. This could be used as an opportunity to look at the causes of forced displacement (absence of security and open conflicts, for example). 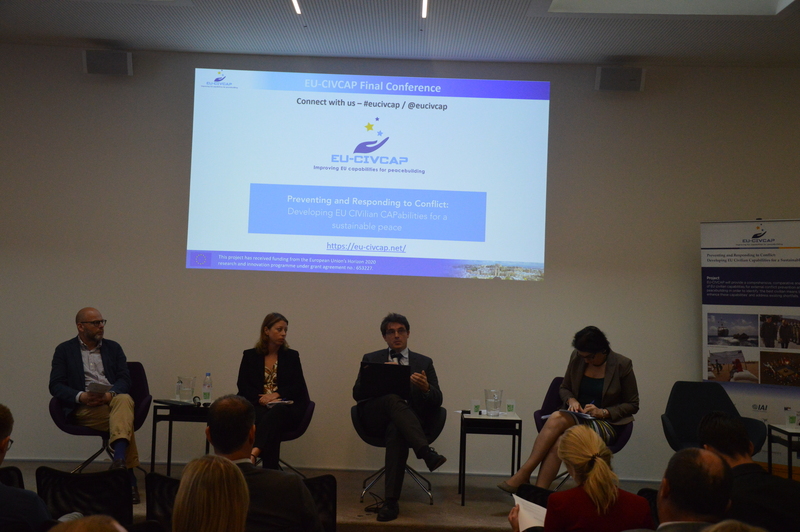 The debate focused on the alignment or otherwise between the interests and values of the EU and its Member States. 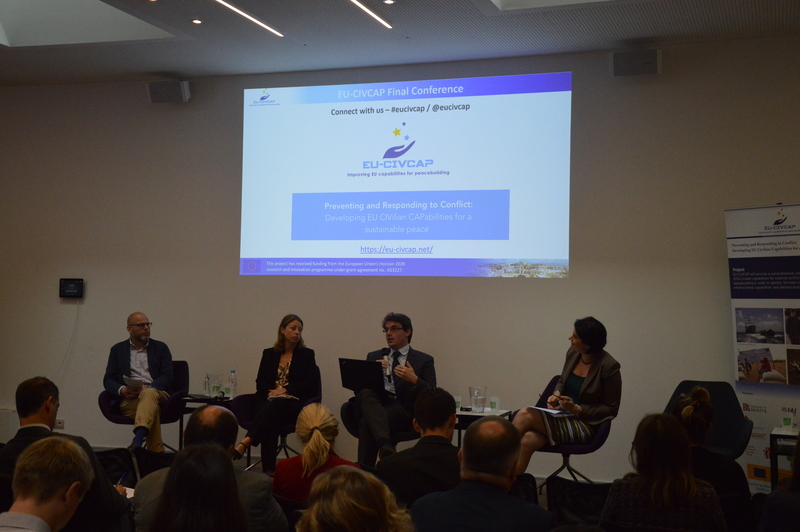 The moderator introduced the panel: Michael E. Smith (University of Aberdeen) on behalf of EU-CIVCAP, and Bert Versmessen (CPCC/EEAS), Barbara Holzer-Bodson (Permanent Representation of Austria to the EU) and Olivia Caeymaex (QCEA – Quaker Council for European Affairs) as discussants. Smith said that EU action was hampered by different approaches to learning and a failure to follow its own rules and procedures. Nobody owns learning as a centre of activity. Since learning is supposed to lead to institutional, legal and political reform to help the EU become a better foreign policy actor, failure to learn is a barrier to a more effective peace and conflict policy. Action often reflects what the EU wants to do rather than what local dynamics demand. 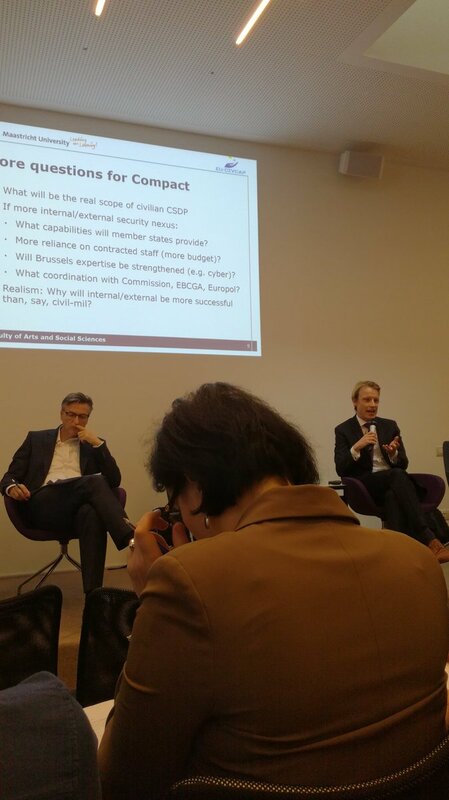 Versmessen asked whether what the EU is doing in terms of civilian missions is enough in the current security environment, and whether it has the right tools for the job. There has been an enormous amount of reinventing the wheel in missions for 15 years, but the EU has become better at standardising. He conceded that as far as evaluation was concerned, it is very hard to measure CPP action. Holzer-Bodson stressed the utility of multidisciplinary academic research such as the EU-CIVCAP project. Last year the EU embarked on a process of strengthening civilian CPP through the Civilian Compact. 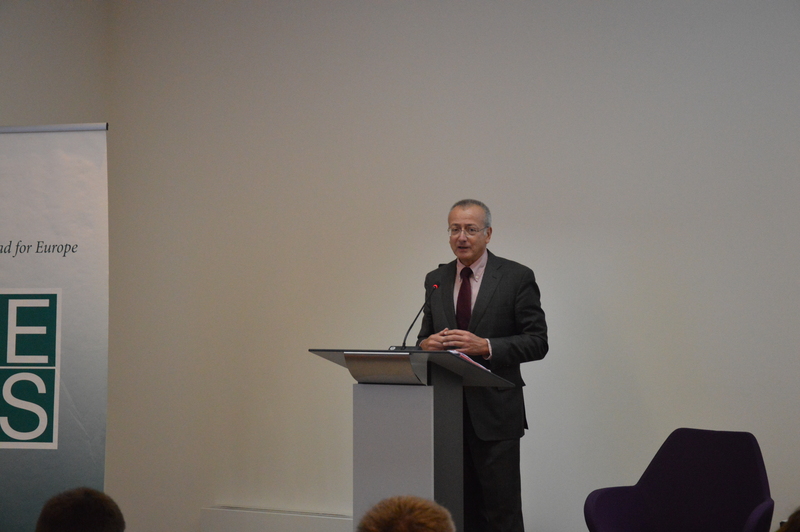 The challenge is not easy, he said, but at the same time, the EU has never been closer to meeting it. 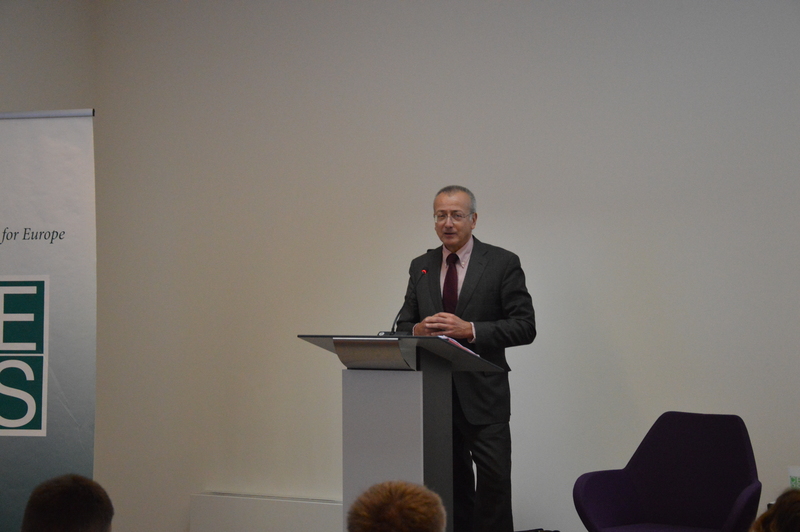 Caeymaex said that there was a lot of research on the changing nature of conflicts that suggested that they have become less conducive to political settlements, more intractable, and more internationalised. This means that if the EU wants to be a relevant actor it will have to think about what kind of actor to engage with and how. It needs to continuously think about how it is going to support sustainable peace. 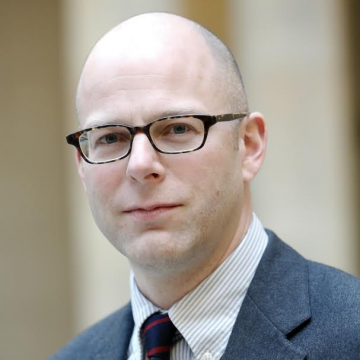 Hylke Dijkstra is an Assistant Professor (with tenure) at the Department of Political Science. 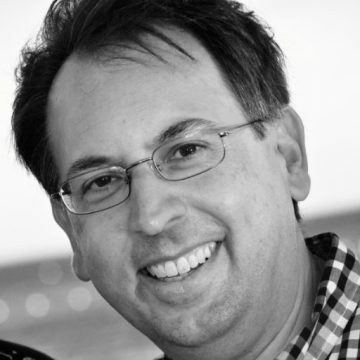 Michael E. Smith is Professor of International Relations at the University of Aberdeen.